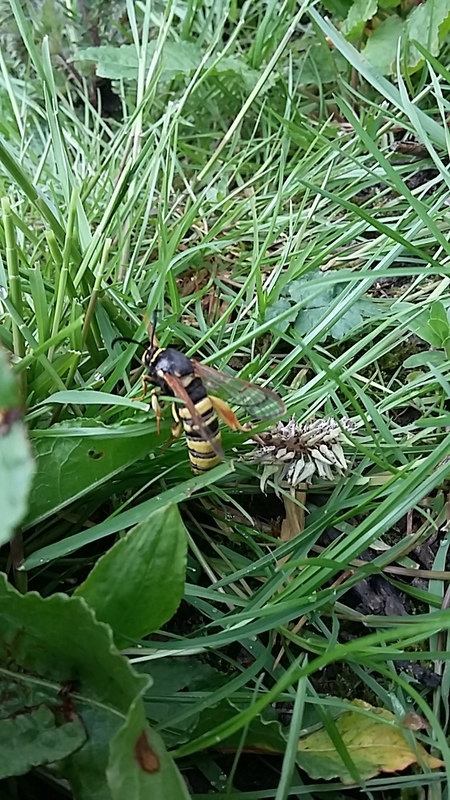 There are only a very few records of adult lunar hornet clearwings in Carmarthenshire. 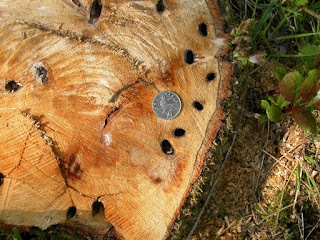 I saw a dead individual on the roadside just S of Carmel village back in 2000, and later found what were almost certainly larval borings in grey willows Salix cinerea on the nearby gritstone ridge a few years later. Simeon Jones also saw and photographed an adult near St Clears in 2006 or so. In 2007 larval borings, which were thought to be of this species, were found in willows at the Wildfowl and Wetlands Trust`s reserve at Penclacwydd SE of Llanelli (see photo below). I have additionally noted larval borings in willows fringing the drainage `pills` at Erw-las (Llwynhendy) and also near to the Morfa Berwig wetland nature reserve (immediately NE of Berwick Roundabout on the A484). Both these latter areas are very close to WWT Penclacwydd and are in the same coastal grazing levels landscape/habitat area. I have looked for adults - which are said to emerge very early in the morning - but failed (it`s always a `long-shot` to seek and find this elusive moth). Today, Barry Stewart (who himself has done a lot of moth recording at WWT Penclacwydd, as well as working there when it was first established) forwarded an email to me that he had received from Rob Werran, a new volunteer member of staff at this wetland reserve. I`ve been noting Rob`s name on the `Carmarthenshire Bird Sightings` webpage, where he`s been reporting some good records, but it now seems that he`s succeeding with moths too! 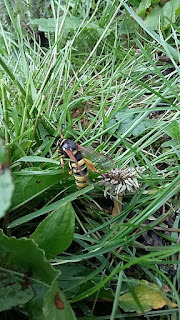 He supplied a record of an adult lunar hornet clearwing at WWT on 11th May (a very early date) seen, incidentally, at about 4.30 PM (rather than its supposed `morning slot`). His photo is shown below - well done Rob - and please keep up the good records! Above: lunar hornet clearwing at WWT Penclacwydd. Photo: Rob Werran. Above: larval borings in grey willow, WWT Penclacwydd 20.4.07. Photo: Nigel Williams. Excellent, and that does seem a very early date. I've still not seen one. I've not seen one either! I have only 4 records in the Carms dataset: Simeon in 2006, Fay Sharpley in Brechfa 2006, Mike Bailey at Carmel 2000 and RSPB Gwenffrwd 1983. Ian, it might be worth you getting your additions to me - thanks.